Rich in rock minerals, this area provides great employment through the several rock industry plants. A favorite hike for the locals is the Heart Creek Trail at the base of the mountain. Within minutes the hiker is deep into the Rocky Mountain wilderness and away from the Trans Canada Highway which runs beside this guardian of the entrance to the mountians. 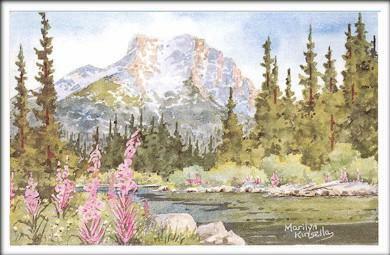 This scene depicts Heart Mountain from the Bow River flowing by Exshaw, with prolific fireweed flowers.